For meats roasted on spits over an open fire or a huge wood burning rotisserie oven, see siu mei. For the Star Wars character, see List of Star Wars characters § M.
Shaomai (simplified Chinese: 烧卖; traditional Chinese: 燒賣; pinyin: shāomài), Cantonese romanized as siu mai, is a type of traditional Chinese dumpling, originated from Hohhot, Inner Mongolia. 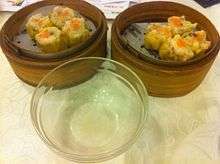 In Cantonese cuisine, it is usually served as dim sum. Along with Chinese diaspora, variation of Shaomai also appears in Japan (焼売, Shumai) and Southeast Asia (Siomay). In the Qing dynasty, the fillings varied by season: garlic chives in spring, mutton and pumpkin in summer, crab meat in autumn, and mixed seafood in winter. Many varieties have been created as shumai was gradually introduced to all provinces, where it was adapted to the different regional tastes throughout China. 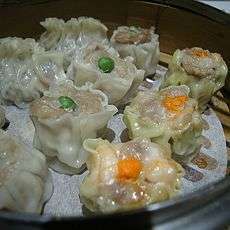 However, most people in Western countries associate shumai with only the Cantonese version due to the Cantonese diaspora. This is the most well-known variety from the south-eastern province of Guangdong. As prepared in Cantonese cuisine, siumai is also referred to as "pork and mushroom dumpling." Its standard filling consisting primarily of ground pork, small whole or chopped shrimp, Chinese black mushroom, green onion (also called scallion) and ginger with seasonings of Chinese rice wine e.g. Shaoxing rice wine, soy sauce, sesame oil and chicken stock. Bamboo shoots, water chestnuts and pepper can also be added. The outer covering is made of a thin sheet of lye water dough. The center is usually garnished with an orange dot, made of crab roe or diced carrot, although a green dot made with a pea may be used. The decorative presentations vary. A fish paste variety of siumai is sold as a popular street food in Hong Kong, usually alongside curry fishballs. It is most often eaten with a sweet soy sauce and chilli oil. Huhhot Shaomai is a regional variety in Huhhot, Inner Mongolia, where Shaomai is considered to have originated. The wrapping is a very thin, round sheet of unleavened dough, with a pleat border. There is only one kind of filling, which mainly consists of chopped or minced mutton, scallion and ginger. Huhhot Shaomai features this extensive use of scallion and ginger, creating a dense combined scent, and a slightly spicy taste. The filling is put in the center of the wrapping and the border of the wrapping is loosely gathered above, forming a "neck" and a flower shaped top. It is then cooked by steaming or pan-frying. Huhhot Shaomai is served in the unit of "Liang", which means either eight steamed ones served in a steamer tier, or eight fried ones served in a dish. "Liang" is equal to 50 grams, being traditionally used as an indication of the total weight of the wrapping. Huhhot Shaomai is commonly served with vinegar and tea, due to its greasiness. Called the chrysanthemum shaomai, this variety is made in Changsha, Hunan (province neighbouring Guangdong). This shaomai is named so, due to its opening resembling the chrysanthemum flower petal shape with the egg-yolk. It is spicy with pepper and the wrapper is translucent. Filling largely consists of glutinous rice, pork hash, shrimp, Chinese mushroom (otherwise known as shiitake) bamboo shoots and onion. Shaomai prepared in the Jiangnan region (south of the Yangtze River, stretching from Shanghai to Nanjing) are quite different. The wrapper is larger and tougher than the Cantonese version. Filling is similar to zongzi, containing soy sauce, Chinese rice wine e.g. Shaoxing wine, marinated pork pieces in glutinous rice and steamed with pork fat. It is larger in size than the Cantonese version. In northern-western China, Uyghur people of Xinjiang adapted the shaomai to two regional varieties. The southern Xinjiang recipes differs slightly from the northern version in terms of ingredients and method. The filling of the northern version consists of mutton or beef, along with green onion and radish, whereas the southern filling primarily uses glutinous rice with smaller amounts of mutton or beef. Minced meat from sheep ribs containing some fat is ideal. Called the Yifeng shaomai in the south-eastern Jiangxi province, its distinct flavour comes from a blend of pork mince, bread flour, sesame seed powder, ground pepper and sugar. It is particularly popular in the area of Yifeng Tanshan Tianbao where it is one of the foods eaten during the Chinese New Year celebration. Shanghai shaomai uses glutinous rice, pork mince, Chinese mushroom (otherwise known as shiitake) and onion. The mince, Chinese mushrooms and onion are stir-fried before being made into shaomai which may then also be steamed. Shūmai in Japan have shrimp as the main ingredient and neither pork nor beef is used in the dough. Compared to the Chinese shaomai which is usually minced, the meat in Japanese shumai is ground to a paste. Siomay or siomai (sometimes called somay) in Indonesia is pronounced the same way as its sisters and is usually a wonton wrapper, stuffed with filling and steamed. It is served also with steamed potatoes, tofu, hard boiled eggs, steamed bitter gourd and cabbages, all are sliced and topped with peanut sauce and kecap manis (sweet soy sauce). Because the population of Indonesia is largely Muslim, pork siomay is rare and is usually made from various fish, most commonly wahoo or mackerel tuna. This variant is less common in Western countries. Siomai (Cebuano/Tagalog: siyomay) in the Philippines is often ground pork, beef, shrimp, among others, combined with extenders like green peas, carrots and the like which is then wrapped in wonton wrappers. It is commonly steamed, with a polar variant being fried and resulting in a crisp exterior. It is normally dipped in soy sauce with squeezed calamansi(Philippine lime) juice, and a chili-garlic oil is sometimes added to the sauce. A recent variant on siomai is wrapped in sheets of laver after the wonton wrappers, which is marketed as "Japanese." Shaomai is considered to have originated in Huhhot, Inner Mongolia, between Ming dynasty and Qing dynasty. As described by historical materials, Shaomai was served in tea houses as a secondary product. The name was given "捎卖", meaning the product was "sold as a sideline", with tea. It is considered to have been brought to Beijing and Tianjin by merchants from Shanxi, causing its later widespread. The name was later transformed into modern forms like "烧麦", "稍美" and "烧卖", changing the characters while keeping the original pronunciation. The product was initially in the form of meat and vegetables wrapped in thin sheets, and was sold weighing only the wrapper, a tradition which is still kept in Huhhot. In Huhhot, Shaomai is served in a class of local, diminutive restaurants, which are generally called 'Shaomai guan', meaning restaurant serving shaomai, mainly as breakfast. Such restaurants also feature dishes made of lamb as well as beef, and commonly have spicy lamb bowl soup as another specialty. These restaurants usually carry out their main business of the day in the morning. They remain open throughout the day, but since Shaomai and lamb bowl soup, which are majorly consumed as breakfast, are the main business, customers are few at lunch and dinner time. Though not their typical business, a variety of Chinese dishes are served in some Shaomai guan, mainly to attract customers at lunch and dinner time. Though a favorite of local residents, Shaomai is not served in big restaurants, because it is not a common component of dinner. Within the dim sum tradition of southern China, shaomai is one of the most standard dishes. It is generally served alongside har gow, another variety of steamed dumpling containing shrimp, cooked pork fat, bamboo shoots and scallions; collectively these are known as hargow-sieu mai (蝦餃燒賣). Chinese dishes are traditionally eaten using chopsticks. In food stalls in Indonesia, siomai (or "siomay" in local dialect) are eaten together with steamed vegetables and tofu, and served with spicy peanut sauce. In Philippine food stalls and fast food restaurants, siomai is eaten as is, with dip, toothpicks to facilitate handling, or with rice (using a spoon and fork). Wikimedia Commons has media related to Shaomai. 1 2 Hsiung, Deh-Ta. Simonds, Nina. Lowe, Jason. (2005). The food of China: a journey for food lovers. Bay Books. ISBN 978-0-681-02584-4. p 38. 1 2 "烧麦的名称由来". news.ganji.com. Retrieved 16 December 2013. ↑ 绥远通志稿. Inner Mongolia, China: 内蒙古人民出版社. 2010. ISBN 9787204090808. ↑ 绥远通志稿. Innermongolia, China: 内蒙古人民出版社. 2010. ISBN 9787204090808.